Many Congratulations... May Allah accept all our efforts and May He make this event a milestone in History. 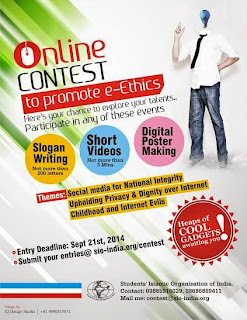 Kindly find attached activity of E- Ethics Competition, Which we have to do in campuses. 18 Dec: SIO is working since last 30 years in this country to prepare students and youths for the reconstruction of society under the divine guidance. Campuses, which are the future of community and country is the working area of SIO. Considering these objectives SIO South Maharashtra has decided to organize 3 regional conferences in Mumbai, Pune and Nanded, which will cover the entire Maharashtra. These conferences are being organized to gather Muslim students specially to develop the great objectives and the real sense of life in them, that they should have balanced thinking, good education and more productive for the country. Today on 18th Dec, at YMCA Ground, Mumbai Central where first conference was organized. 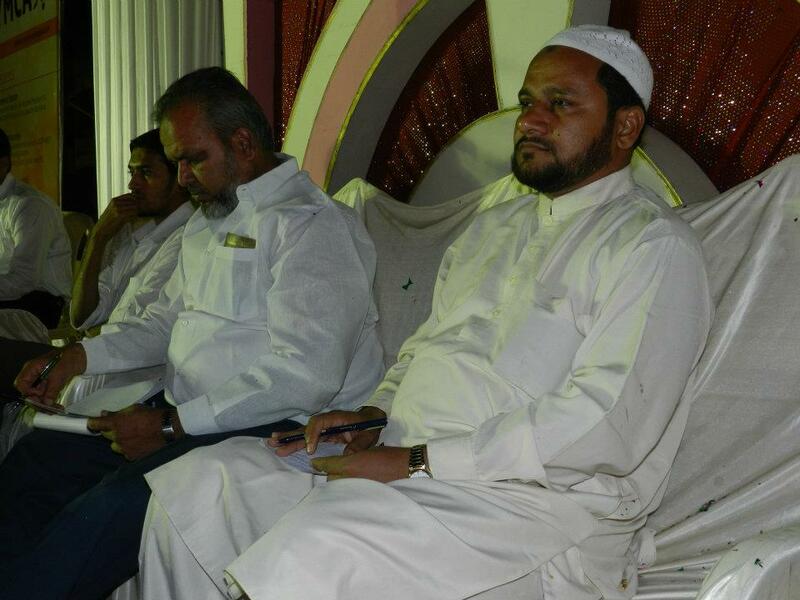 Dr. Javed Mukarram Siddiqui (Renowned Scientist, Aurangabad) appeared and S. Ameenul Hasan (Psychologist, Member Central Advisory Council, JIH) as chief guest, while Mohammed Azharuddin (National President, SIO), P M Salih (Secretary General, SIO ) as National personalities. The first speaker Dr. Javed Mukarram Spoke on the topic “You Inherit this You Are The Builder Of New World” (Teri Nisbat Barahimi Hay). In his speech he said that Muslim Community and specially Muslim Youths and Students must have this confidence that they are the builder of this new era and they have the great objectives. It is our responsibility to convey the message of Islam, the message of peace to the whole world and to develop ourselves more and more to serve the society. S. Ameenul Hasan spoke on the topic of “Hum Subah Yaqeen Hai” (We are the affirm down of this world), he started with the era highlights and presented how this world has changed. Presented various stats of money which is used only to serve the cream of society, while poor people are still dying of hunger. He presented the stats of various deaths of world people by hunger, riots and war. 1. First present Islam by your character. Pray Namaz, read Quran, read Seerat, our walking, eating, living shall represent Islam. Our life shall not be wasting of time, involvement in crime and doing all evils. Purify yourself. 2. Enrich yourself with Education. Excel in the field of education. Lot of new research are creating a paradigm shift in human life. Never drop education, if you find a financial problem SIO is with you. 3. Social work: He told two very emotional stories about social work and motivated the students do get indulge in this day and night. 4. Dawah: today it’s an immense need of the hour to spread Islam, this is the real service of mankind. P M Salih, spoke on the topic “SIO-celebrating campus creativity”. “The present education system is full of materialism” He pointed. On the other side ISLAM addresses logics, materialism, and spirituality for the man. SIO calling with full enthusiasm to reform the educational system by research and study. For this SIO gave suggestions to LINGDO COMMITTEE, NKC, University Reforms, etc and all the suggestions of SIO were accepted. Continuing with his words he told that the change which we want to call must be first within us, within our family then in the society. 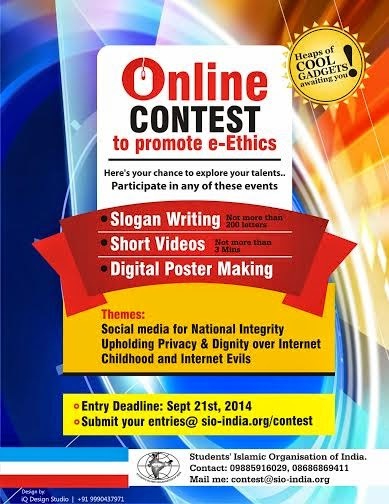 We should stand against the evils of society. In the conclusion the conference National President of SIO, Md Azharuddin spoke on the theme “Discover Yourself” (Apna Maqam Paida Kar). He told that this era is the era of change. Different changes are being taking place in the world like Tehrir Square, Wall Street protest, Anti corruption campaign in India, etc. But these changes are partly changes. The need is to change whole system which must be on the basis of peace and justice. And ISLAM is the competent religion for this. In this Students should know themselves; they should prove their abilities to the world. Second thing is social media, in the present world everyone has got power of media because of social networking, we must use them for the constructive purposes. Finally with the thanks of Br. Javed (Conference Coordinator) program got ended. A grand Student Meet held at Dongre Compound, Tanwar Petrol pump, Mumbra with the theme “Apna Maqam Paida Kar”. To welcome the Guests a Bike Rally was organized up to the venue. More than 3000 students and local people attended the conference. 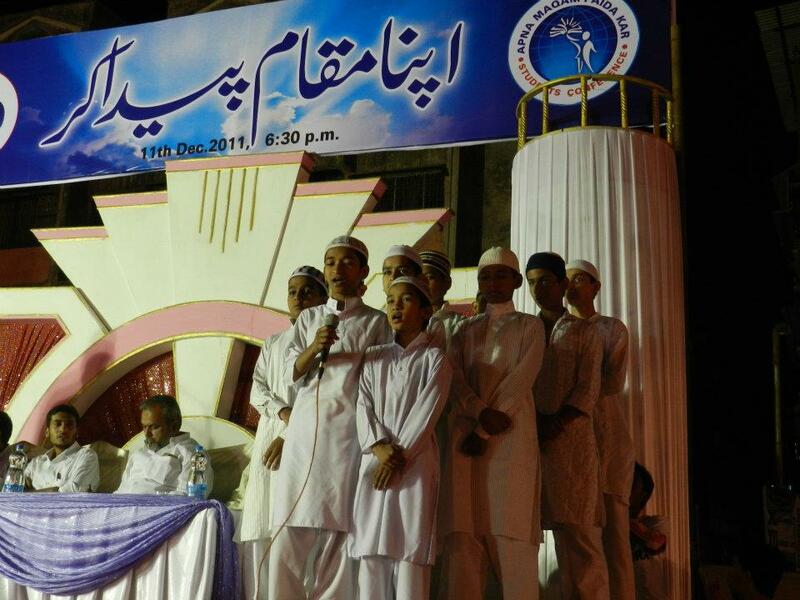 Conference started with recitation of Quran followed by its Tarjuma (translation) in Urdu. Br. 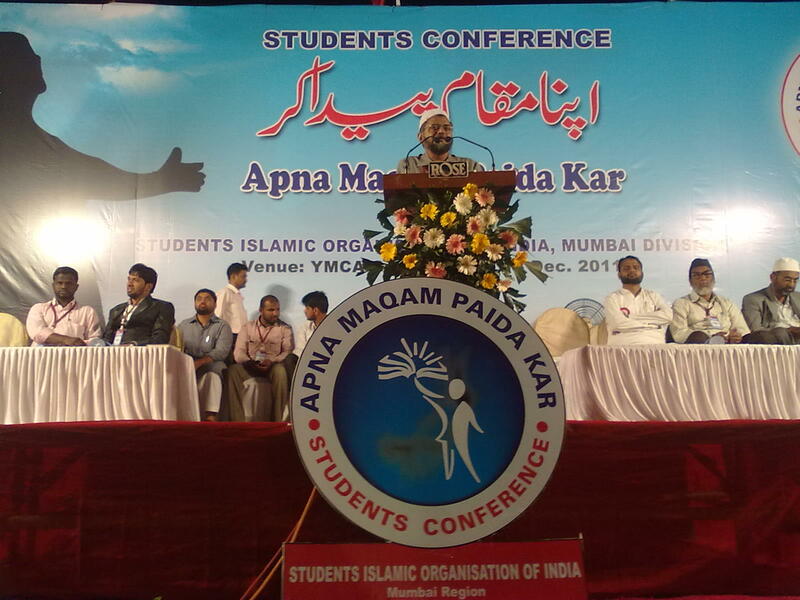 Mirza Kamran Baig (President- SIO Mumbai Division) gave a brief intro of the theme. In which he pointed various evil deeds in our Muslim students-youths and our Muslim society. Also stated the role played by SIO to make them understand the difference between right and evil. 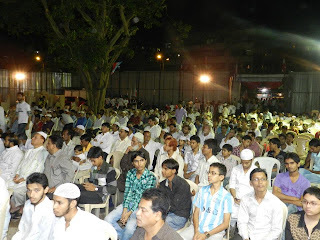 “Mar Jayeng Imaan Ka Sauda Na Karenge” Tarana was then sung by Islamic Friends Circle (IFC) of SIO Mumbra. “Aae Naujawan! 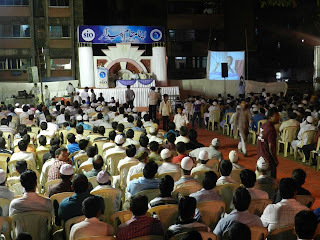 Teri Manzil Kahan Aur Tu Gum Kahan” was the topic highlighted by Janab Abdul Waheed Sahab (Ex-President SIO Mumbai); in this taking help of some statistics clarified the present scenario and position of Muslims in our society. Coming to Education he said that only 17% of Muslims pass SSC whereas 2% get graduated and 1.3% goes for Post-graduation. By giving an example stated that we Muslims no longer bear any value in this society also we never ever tried to achieve it. He also explained how much do our country cares for us. He even explained the way we are misusing technologies such as Television, Internet, Mobile, etc. “Mohabbat Hai Mujhe Un Naujawano Se” in this topic Janab Mujtaba Farooq Sahab (National President,Welfare Party of India-WPI) pointed that it is our indeed necessity to follow and implement teachings of Prophet Muhammad (PBUH) in our daily routine life. Giving a review of prophet’s life in Makkah and Madina highlighted that those were just handful of sahabas who come hand to hand and accepted Islam and again those few Sahabas fought to spread Islam, either we take a look of Badr or Uhad. With this he specified that being minority it is necessary for us put double and triple efforts in order to succeed from this overwhelming majority. He even made a comment on how we Muslims are used and thrown in politics just for the sake of votes by our politicians. He asked the students to become expertise in Indian laws and bureaucracy so we can contribute to the society. On public request SIO associates performed a Drama in which they showed how much our current generation values their parents. “Indian Society and Role of Muslim Youth” was tackled by Janab Siraj Sahab, he emphasis on social issues and asked students and youth to come forward to contribute Indian society to eradicate the social evils like corruption, castism and communal violence. After that “Aae Naujawan” Tarana was sung by Islamic Friends Circle (IFC) of SIO Mumbra. Br. Hamidullah Shaikh (President – SIO Mumbra Unit) presented a short audio-Visual Documentary about various SIO Mumbra activities so far. Janab Tahir Shah Sahab (Principle, AlFalah High School) emphasizes the role of parent in monitoring the morality and character of their children. He requested them to be alert and aware of their children’s company and friend circle. In the end he made an appeal to connect with SIO in order to stay away from evils. In the end Br. Zubair (Conference In charge of Mumbra) briefly explained about AML-Apostle Multimedia Library, an alternate to electronic evil to speared the message of Peace, Justice and Humanity. Conference concluded with a vote of Thanks and Dua by Br. 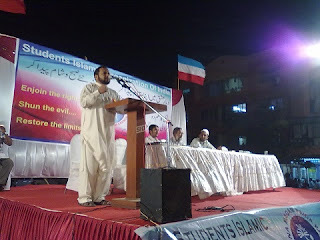 Ziyaul Islam (Secretary - SIO Mumbai Division). Mira Road, Mumbai (10.12.11). 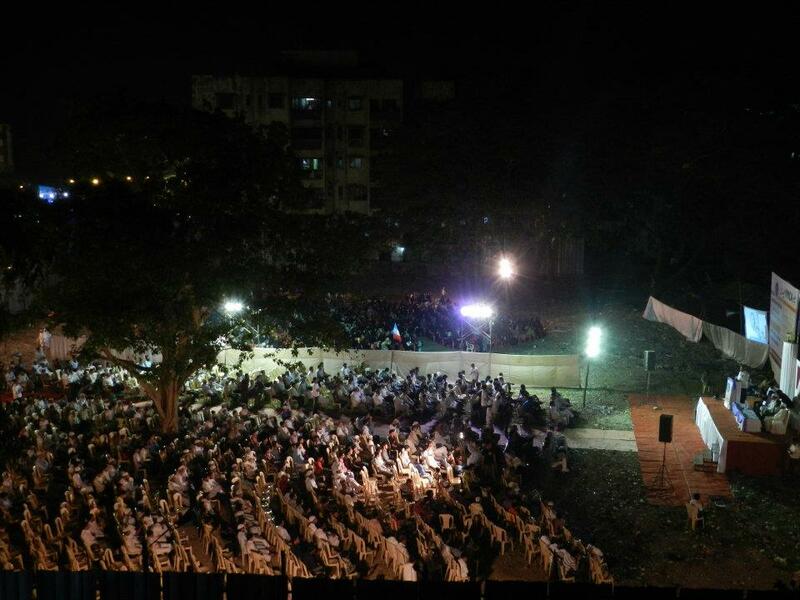 A grand students’ Meet of about 500 attendees was successfully organized here in the eve of this sat. One of the biggest events for SIO Mira Road. 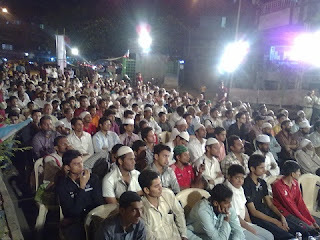 The program started with recitation of Quran along with English and Urdu Translations. Inaugural Speech was delivered by Br. Kamran (President SIO Mumbai). The program was presided by Jb. 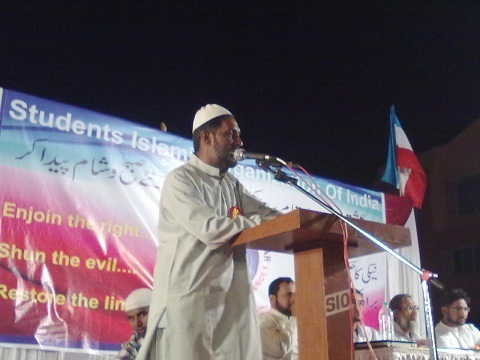 Abdul Qawi Falahi sb (Aurangabad). In his inaugural words Br. Karman covered the various avenues SIO is working in. He dealt with the present scenario we are living in. Highlighted the contribution of youth in particular in every era. “Contemporary middle east revolution headed by youth and students” He added. "Intellectual Dynamic is the current identity of SIO" he highlighted. Finally he concluded that SIO is only organisation working for students and youth to prepare them for reconstruction of society in the light of divine guidance. “Present Scenario and youth” was tackled by Jb Tahir Shah Sb. He described the plight of students and youths being indulged in various addiction especially drugs/tobacco/sedative. Not using TIME for self improvement, rather killing it was his conceren. He raised grave concerns over parents not giving as much attention as required towards their wards. Finally concluded with appeal to all youth to come forth and play their role for society. The main speech of the program “Discover Yourself “was delivered by the Jb. Abdul Qawi Falahi sb. He covered the youth mentioned in Quran in various verses. He started with Sura Aeraf where Allah (SWT) exalted the position of some youth who separated from the community only for Allah. He came to Surah Yusuf mentioning the elevated character of Prophet Yusuf (A) when all the evils of female society called him up and situation he said was like girls walking on ramp, Prophet Yusuf (A) abstained from any filthy things and Allah (SWT) saved him. “Today we need character of Prophet Yusuf (A) , Prophet Ibrahim (A) as youth” He added. Quoting various life of Sahaba as youth namely Musab bin Umair (R), Hanzala (R) and Saad (R), he cited examples of the contemporary situation of Palestine and entire middle east. 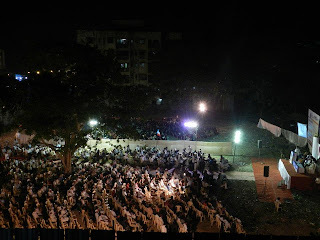 Gripped the youth living life aimlessly and urged the students to become a part of great organisation SIO to succeed in the life here and hereafter. Finally program concluded with vote of thanks and Dua. SIO Mira road has burned the midnight oil to bring about this marvelous piece of work in the life of students.